Happy Black Friday! The biggest shopping day of the year is finally here. I hope you’ve scored the deals you wanted or are about to. And, if you didn’t, there’s always Cyber Monday. The past couple of years I have been pretty good about avoiding the shopping madness, but who knows about this year. The past couple of months I’ve been good about keeping my shopping budget in check so let’s hope I don’t do too much damage! To celebrate the “holiday”, what’s better than an all-black outfit? Donning my finest black beauties (okay, and a couple black and white pieces for visual interest) only made sense! Recently, I was introduced to Boohoo, a UK based brand for affordable women’s clothing, shoes, and accessories. They reached out and offered to send a few pieces to help me celebrate Black Friday, and I was more than happy to pick a few staples to add to my closet! When I saw this collared dress, I was reminded of a similar collared dress I styled at Kate Spade for a fashion event at Pacific Place Mall here in Seattle. While it’s missing some of the embellishments, it’s a classic cut that flatters almost every shape. (I’m also a big fan of this collared dress too http://www.boohoo.com/new-in/marisa-beaded-collar-shift-dress/invt/dzz93255, but it wasn’t available at the time!) This dress may have to end up with a little DIY collar embellishment in the future. 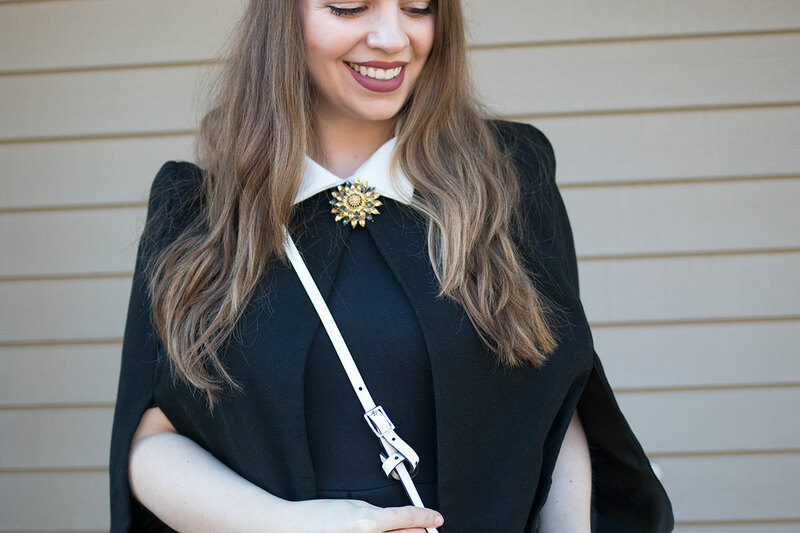 I’ve also been wanting to add a cape coat to my wardrobe, and I thought this would be an excellent opportunity to try the trend out. 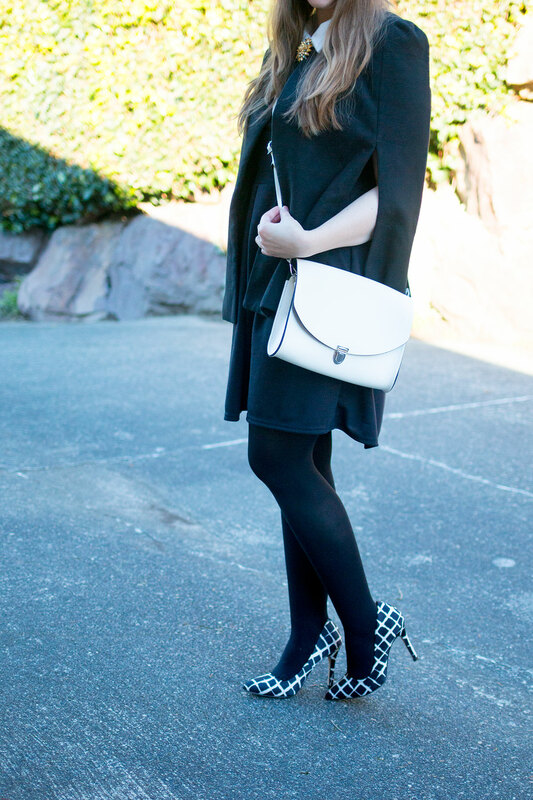 I’ve seen a lot of oversized capes that swallow up petites, but this cut is very flattering! I ordered based on my standard measurements (so a UK 10) and found the fit to be perfect for what I was looking for. 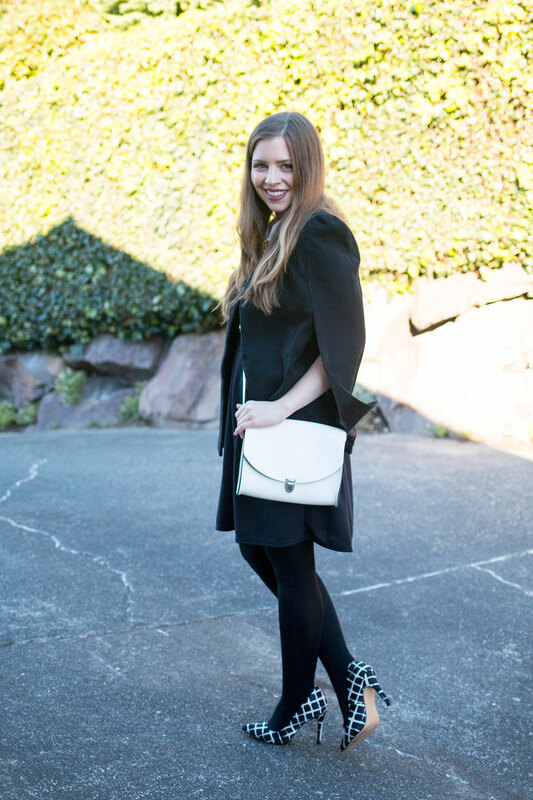 While the coat is not super thick, it adds classic style and interest to an otherwise simple outfit. I topped it with a brooch to add some visual interest, and I thought it was a bit more unusual than a statement necklace. I hope you have a wonderful and drama-free Black Friday and are prepping yourself for the online mayhem on Cyber Monday. Oh, and P.S. Boohoo is also having a sale! Tons of markdowns across their website, up to 70% off, and free shipping all day! You always pull off these classy and stylish looks so well! I feel like I would look ridiculous in a cape coat! I love that cape coat! I live in a hot climate, but every year I want to buy a new coat, lol! Thanks Ree! I’m jealous it’s warm where you are. It’s a little too chilly for me in the 30s and 40s! ok your hair is gorgeous! I am dying over that cape!!!! The shoes. I love the shoes. I think though, I would wear more white with the black outfit so the shoes don’t stand out so much, Or something with a similar BW pattern but not the exact same. Love them. Oh gosh, I love those shoes! What a gorgeous outfit. I love that coat! So classy! Thanks so much, I love it too! Your outfit is so cute but I am especially in love with those shoes! Adorable!